The Bible - How We Received It And Why I Believe It A Movie called the DaVinci Code, based upon a book of Fiction written by Don Brown. Many very displeased! 1 The Bible - How We Received It And Why I Believe It A Movie called the DaVinci Code, based upon a book of Fiction written by Don Brown. Many very displeased! –Catholics painted in a bad light. –Bible believers upset – Jesus depicted as married to Mary Magdalene, the two depicted as having a child, with some of their descendants alive in todays world! – Described as fiction written as history. 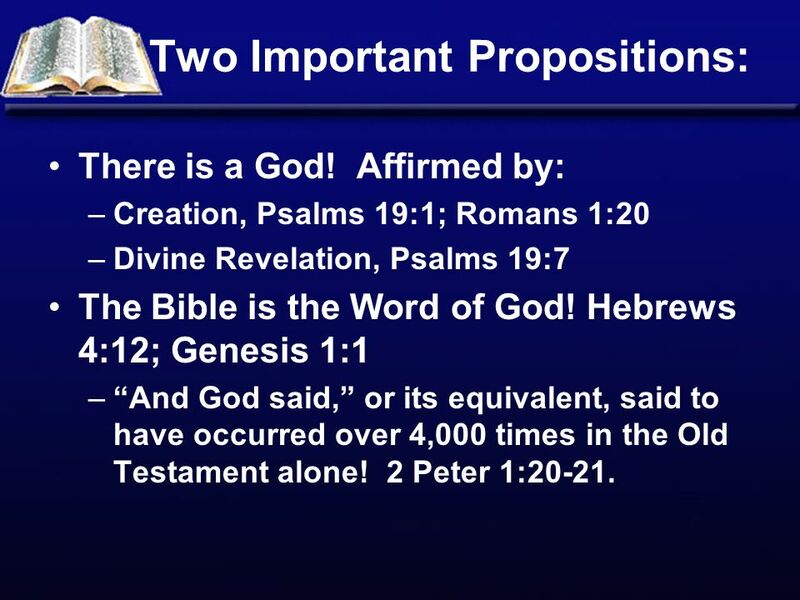 2 Two Important Propositions: There is a God! Affirmed by: –Creation, Psalms 19:1; Romans 1:20 –Divine Revelation, Psalms 19:7 The Bible is the Word of God! Hebrews 4:12; Genesis 1:1 –And God said, or its equivalent, said to have occurred over 4,000 times in the Old Testament alone! 2 Peter 1:20-21. 3 The Bible Constitutes Divine Revelation! Revelation – a laying bare, or making naked. It denotes a disclosure of truth, a giving of instructions concerning things which are divine, and which make known as it were the mind of God. I Corinthians 2:10-13. 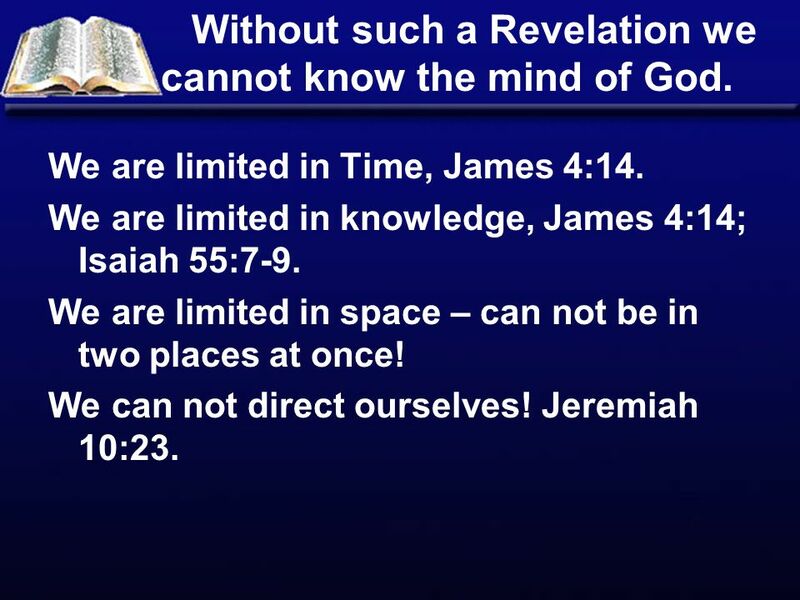 4 Without such a Revelation we cannot know the mind of God. We are limited in Time, James 4:14. We are limited in knowledge, James 4:14; Isaiah 55:7-9. We are limited in space – can not be in two places at once! We can not direct ourselves! Jeremiah 10:23. 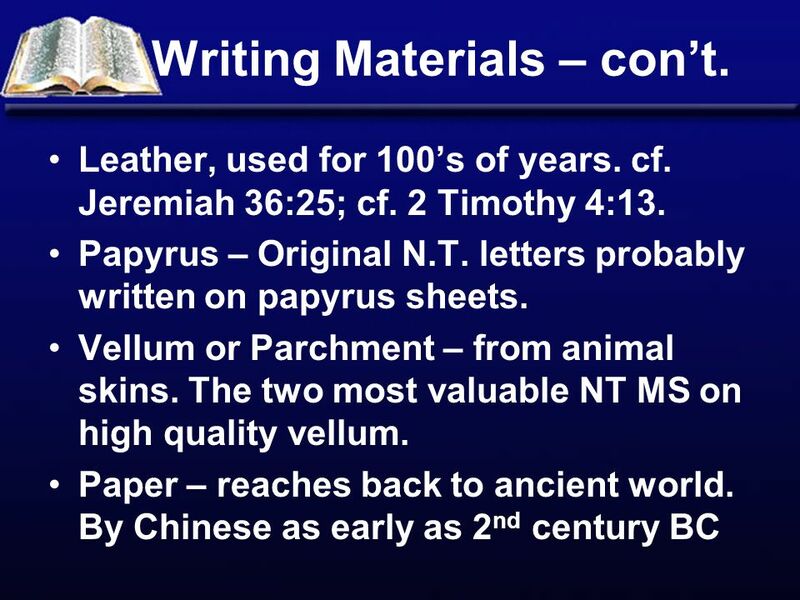 6 Writing Materials Were Varied Stone, Exodus 31:18; Joshua 8:30-32. Clay – huge libraries of clay tablets unearthed from Assyria and Babylon, including the library of Ashurbanipal (650 B.C. ), 1,000s of tablets. cf. Ezekiel 4:1. 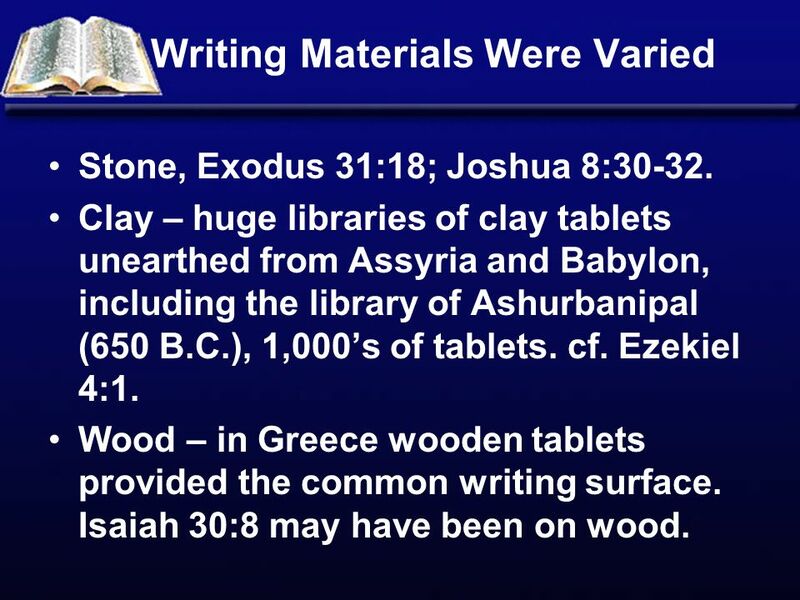 Wood – in Greece wooden tablets provided the common writing surface. Isaiah 30:8 may have been on wood. 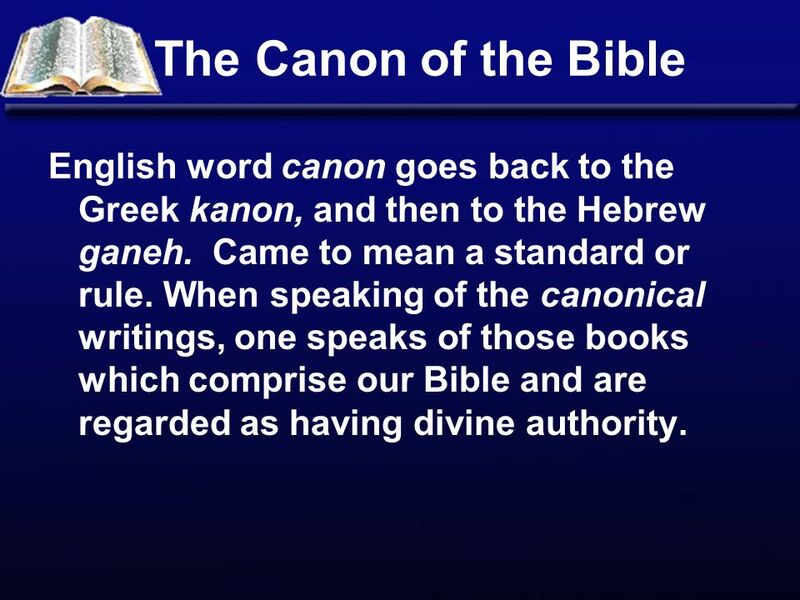 9 The Canon of the Bible English word canon goes back to the Greek kanon, and then to the Hebrew ganeh. Came to mean a standard or rule. 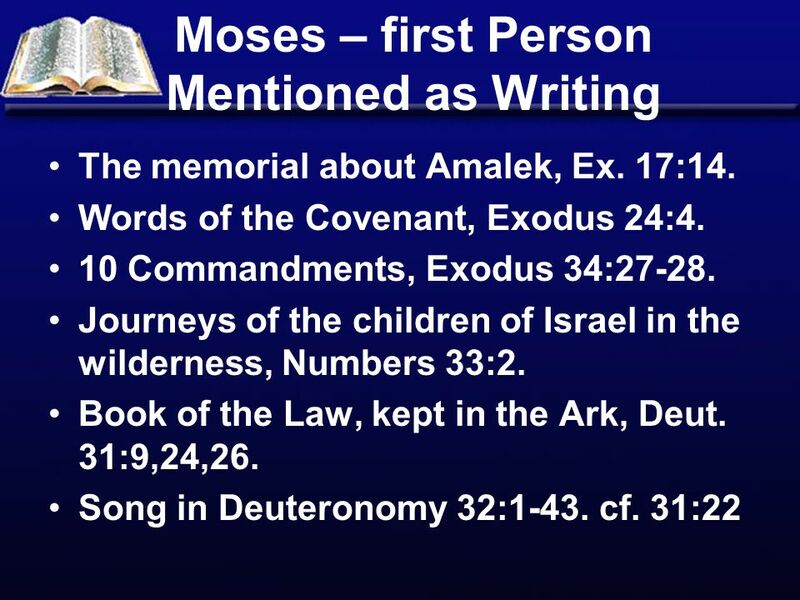 When speaking of the canonical writings, one speaks of those books which comprise our Bible and are regarded as having divine authority. 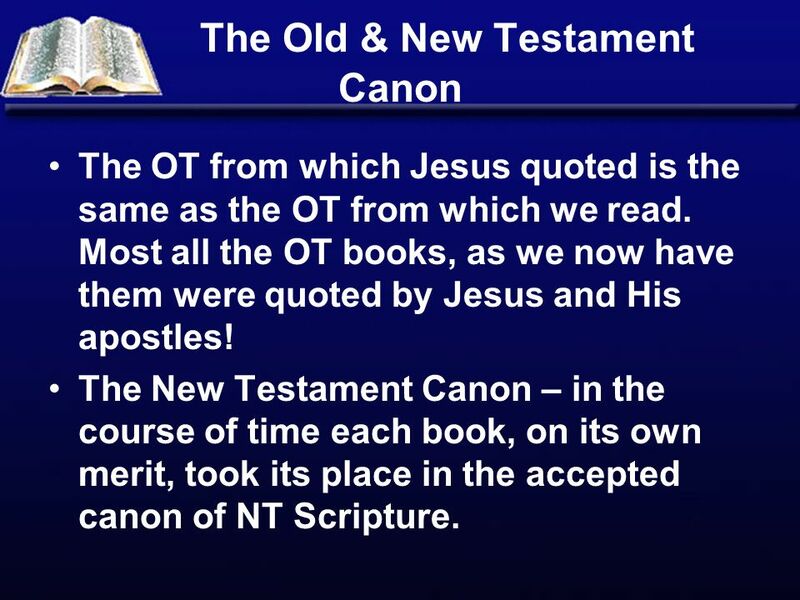 10 The Old & New Testament Canon The OT from which Jesus quoted is the same as the OT from which we read. Most all the OT books, as we now have them were quoted by Jesus and His apostles! The New Testament Canon – in the course of time each book, on its own merit, took its place in the accepted canon of NT Scripture. 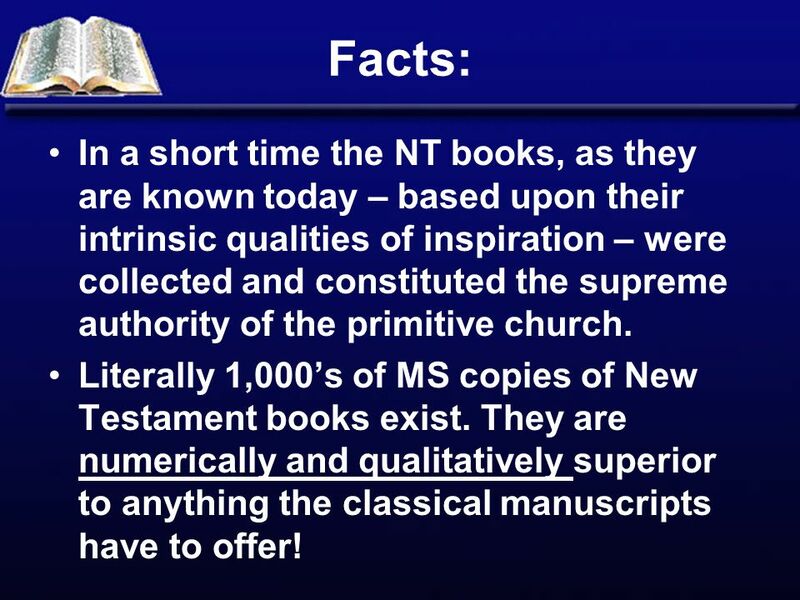 11 Facts: In a short time the NT books, as they are known today – based upon their intrinsic qualities of inspiration – were collected and constituted the supreme authority of the primitive church. Literally 1,000s of MS copies of New Testament books exist. They are numerically and qualitatively superior to anything the classical manuscripts have to offer! 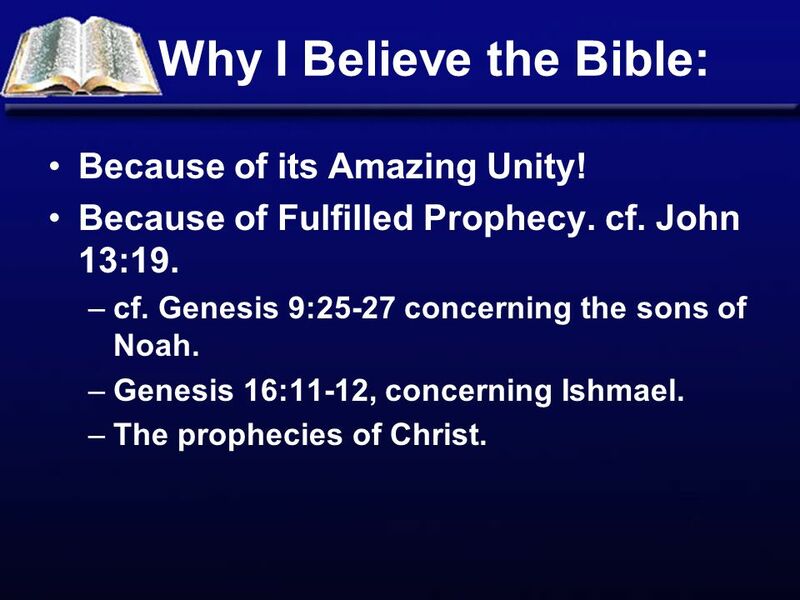 12 Why I Believe the Bible: Because of its Amazing Unity! Because of Fulfilled Prophecy. cf. John 13:19. –cf. Genesis 9:25-27 concerning the sons of Noah. –Genesis 16:11-12, concerning Ishmael. –The prophecies of Christ. 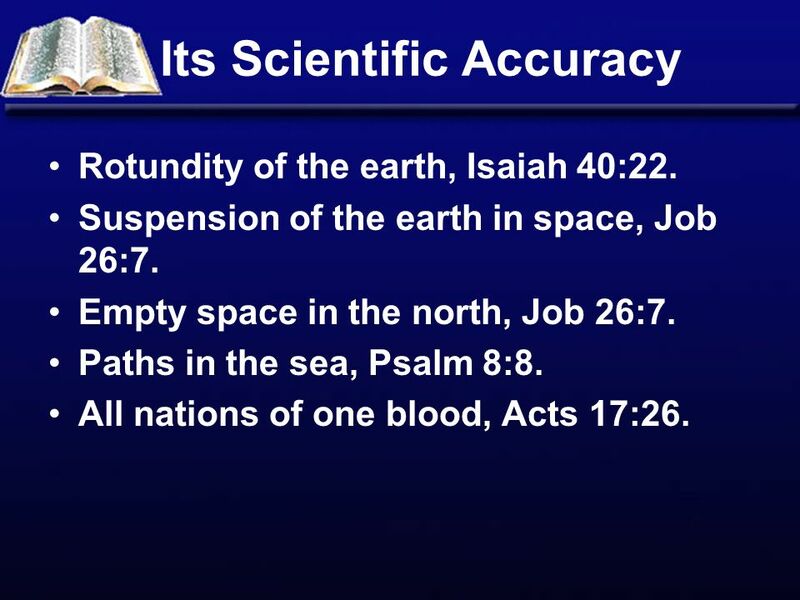 13 Its Scientific Accuracy Rotundity of the earth, Isaiah 40:22. Suspension of the earth in space, Job 26:7. Empty space in the north, Job 26:7. Paths in the sea, Psalm 8:8. All nations of one blood, Acts 17:26. 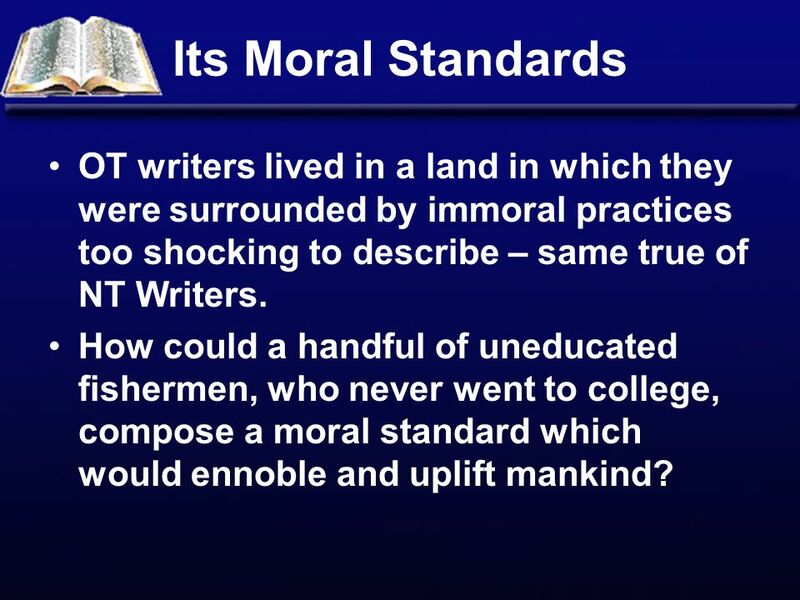 14 Its Moral Standards OT writers lived in a land in which they were surrounded by immoral practices too shocking to describe – same true of NT Writers. How could a handful of uneducated fishermen, who never went to college, compose a moral standard which would ennoble and uplift mankind? 15 Moral Standards – Compare: The Bible with the Koran which would replace a religion of love with cruelty and cause the female half of the population to sink to the level of slaves! The moral standards of the countries where the Bible is taught and has free course with other countries where the teaching of the Bible is restricted! 16 Its Survival! Its enemies have been here from the beginning – legion in number, often very powerful. 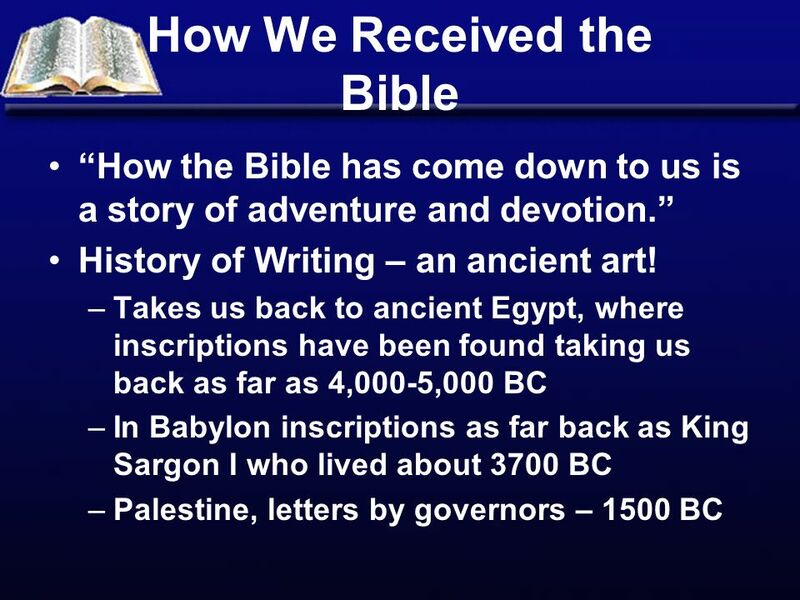 Yet the Bible survives! Why? 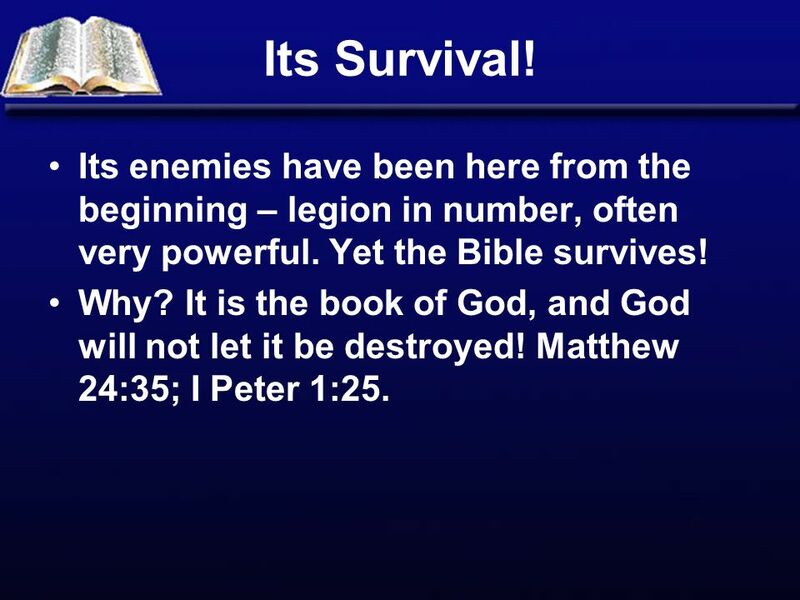 It is the book of God, and God will not let it be destroyed! Matthew 24:35; I Peter 1:25. 17 Conclusion: The Bible came from God! It is true from beginning to end! Psalms 119:160; John 17:17. The DaVinci Code is fiction. 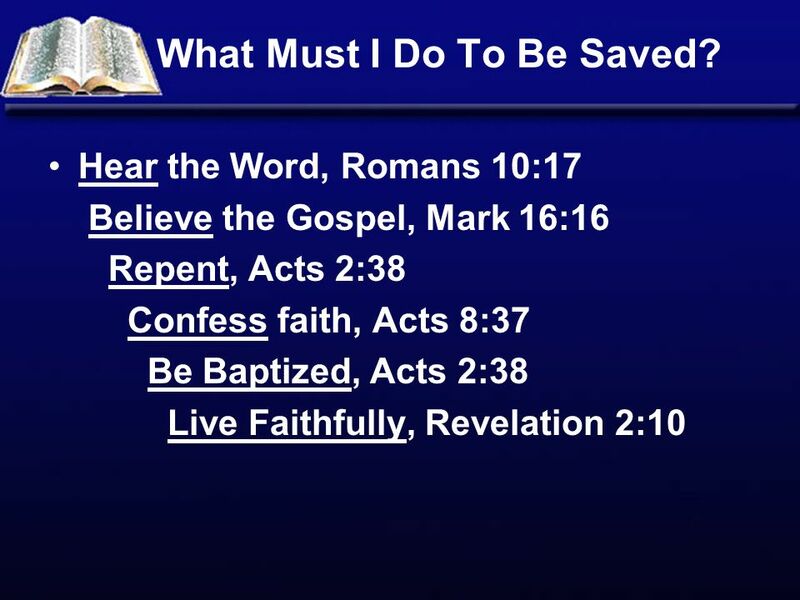 We must believe in the Jesus of the Bible! 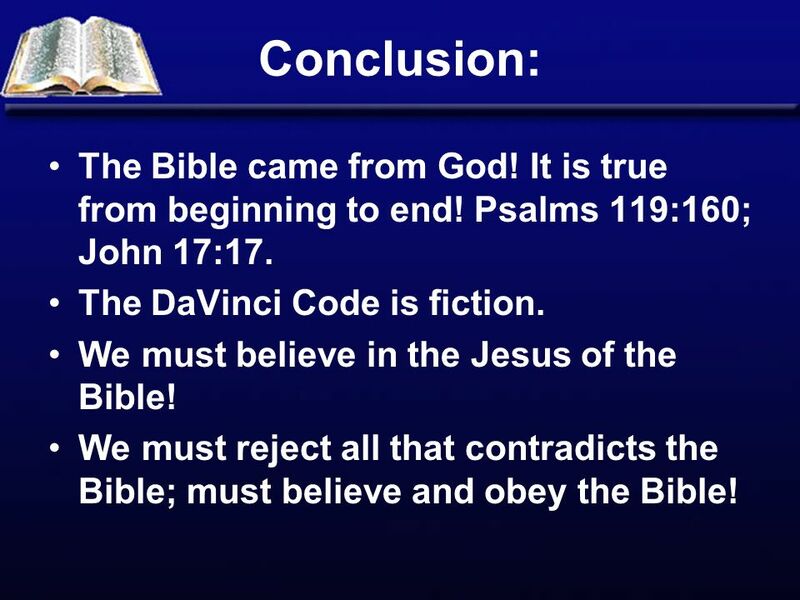 We must reject all that contradicts the Bible; must believe and obey the Bible! 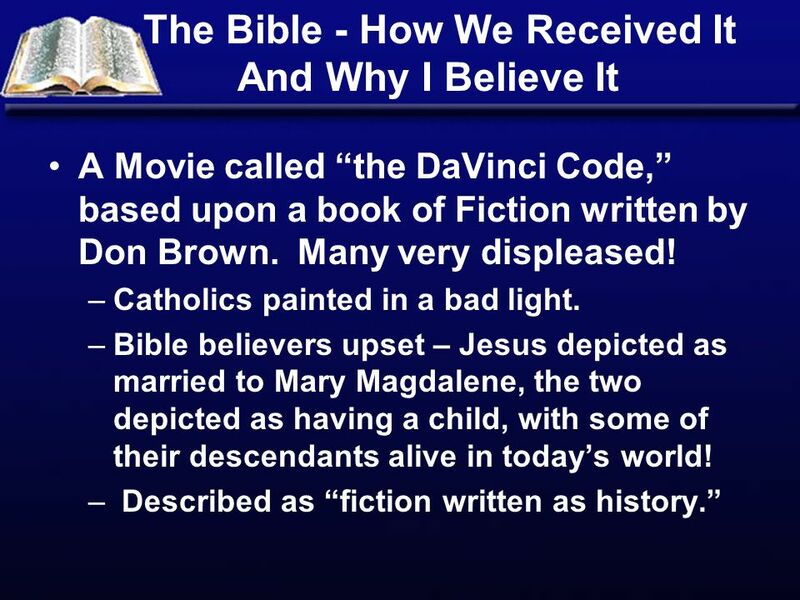 Download ppt "The Bible - How We Received It And Why I Believe It A Movie called the DaVinci Code, based upon a book of Fiction written by Don Brown. Many very displeased!" Bible Is Really Amazing That We Are Dealing With A Library! The Nature and Character of God. It is the temptation and instinct of mankind to create in our own sinful minds a “god” that is the figment of our imagination.